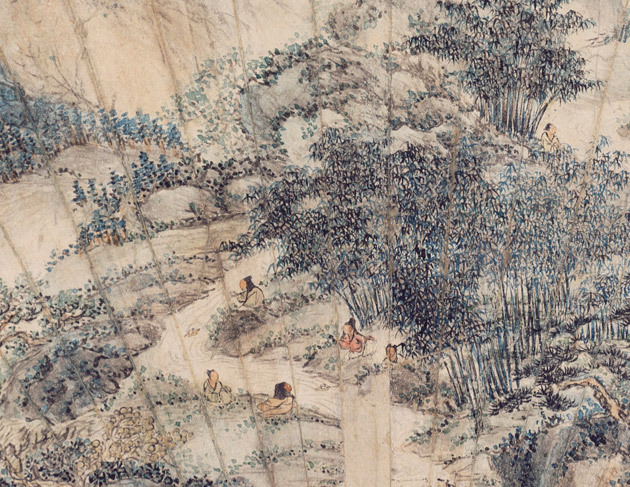 The Orchid Pavilion Gathering (detail), 1732, color added 1739, Chen Fu, Chinese, active 1730s, ink and color on paper, 13 1/4 x 25 7/8 in., Seattle Art Museum, Eugene Fuller Memorial Collection, 52.138, Photo: Elizabeth Mann. Majestic landscapes are metaphors for human emotion in Chinese art. They evoke melancholy and disquiet. They express elation or resolve. They record memory and history. Images of the wilderness, pure and pristine, offer a mental refuge and represent real or imagined places with powerful cultural, historical, and religious associations. Some works envision man’s place in the cosmos, depicting sacred mountains as a paradise between heaven and earth. Pictures of villas or garden estates express a desire for reclusion and allow busy viewers to imagine themselves at leisure in the countryside, or to fancy themselves as hermits. Certain individuals who retreated into nature became models of moral integrity. For example, the Seven Worthies of the Bamboo Grove were Daoist philosophers, writers, and musicians of the 3rd century known for their free and rustic lifestyles. Over the centuries, fishermen, woodcutters, and ox herders developed into cultural archetypes, living the closest to nature. These pastoral figures represent nostalgia for an unspoiled landscape and thus an unspoiled society. But paradise and dystopia are two sides of the same coin, and images of mountains and streams, clouds and mists, gardens and rocks, reveal many different layers of meaning. 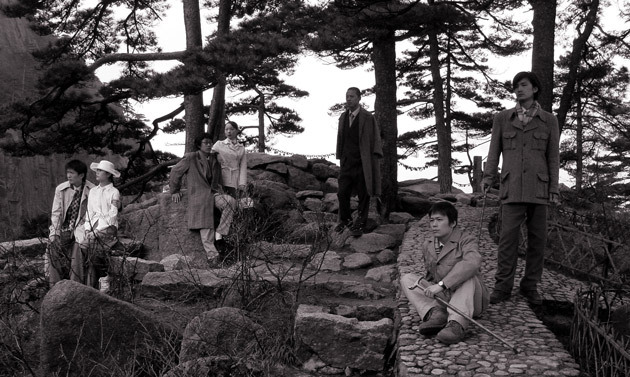 This exhibition juxtaposes classical Chinese works with a modern classic by filmmaker Yang Fudong to demonstrate landscape as an enduring subject of artistic, philosophical, and environmental reflection from the 3rd to the 21st century.